Well, I’m pleased to report that Brian and I are still happily married to one another, and we actually have stayed well within our house’s budget. 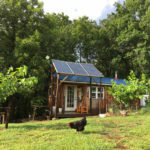 However, I can absolutely attest that everything DOES take twice as long to build, especially when balancing building with homeschooling two young children and attending to other homestead chores. 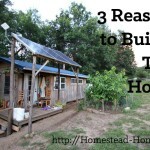 And more importantly, it is extremely challenging to work on a house while living in it. Earlier this summer, we moved our kitchen outdoors, and brought our bedroom to a tent. 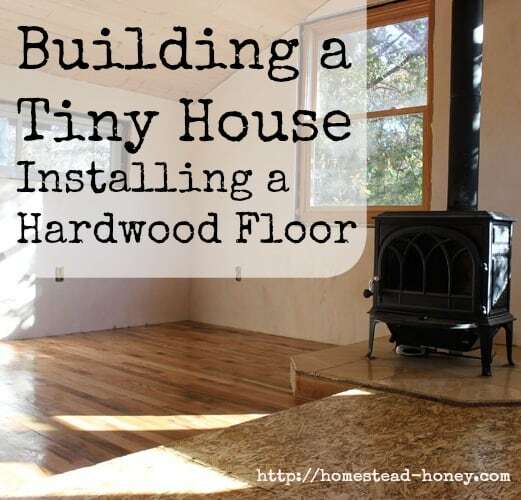 All of this was in preparation for finishing the walls and floors of our 350 square foot home. 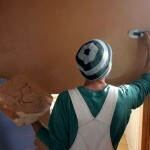 The walls were plastered with a gypsum plaster that was tinted with natural pigments. The flooring had been purchased months ago – we actually really lucked out at an auction with a bundle of oak flooring that we bought for $65. 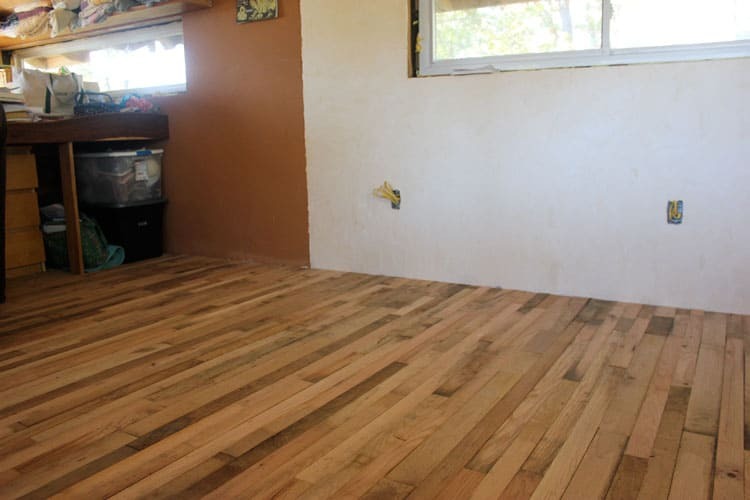 All that was left was to completely clear the house so we could install, sand, and finish the living room floor. You can see here the cottonwood subfloor on the right and the oak going in on the left. 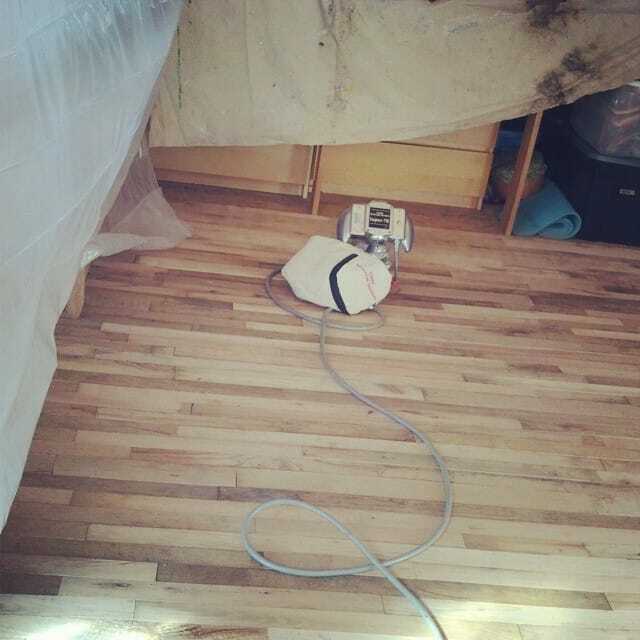 We used a Bostitch Manual Flooring Nailer that we borrowed from our neighbors. 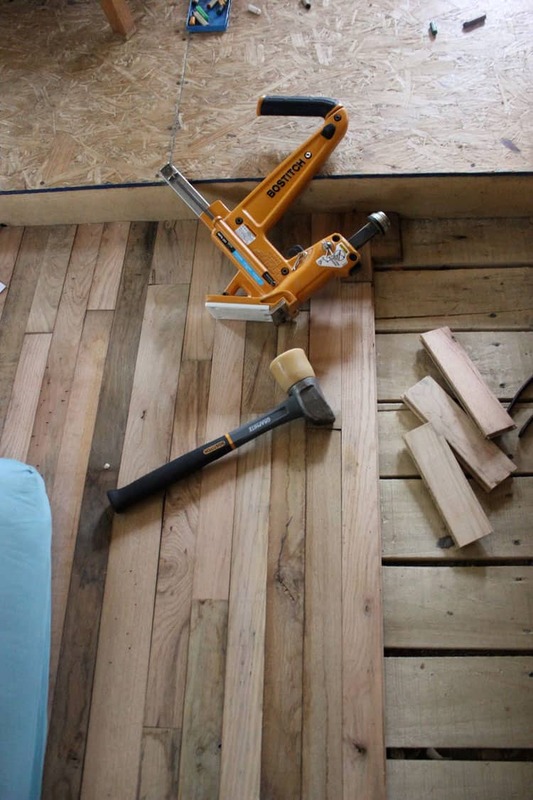 A few days later…the floor has been installed! Preparing to sand, with our bed loft converted to a storage space! All sanded and ready to seal! While we did rent a drum sander, we found that our generator was not able to power it. So, Brian used the edge sander for the entire floor. It did a great job, but sure led to some sore muscles the next day! 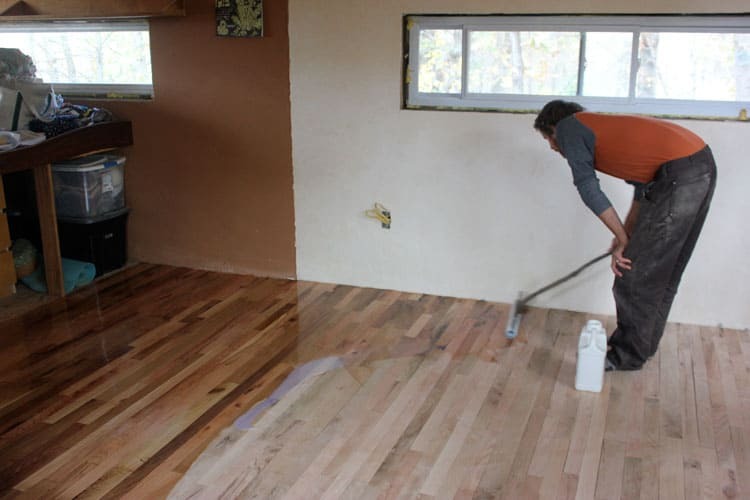 Brian then applied a very low VOC polyurethane finish to the floor. 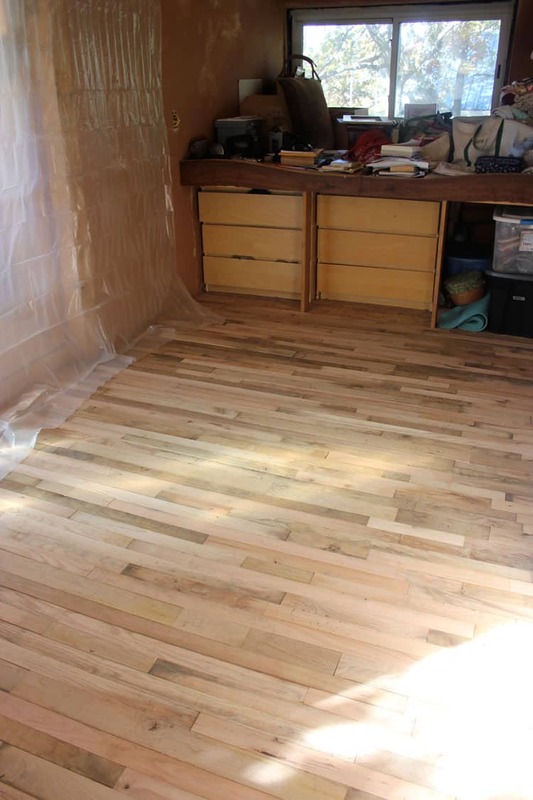 We did 4 coats in the living room, and also sealed our kitchen floor. Our Tiny House is almost finished! 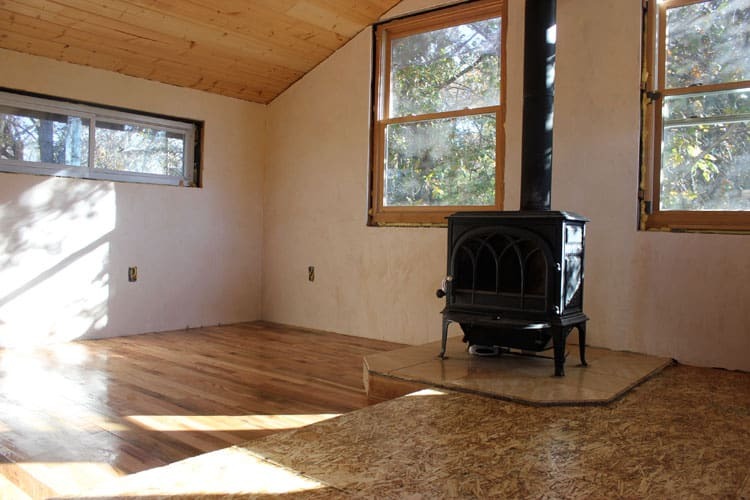 A bit of trim, some built-in shelving, and perhaps a coat of natural paint on the wall behind the woodstove, and we’re good to go! Hi there! I’m visiting from the Art of Home-Making Mondays. 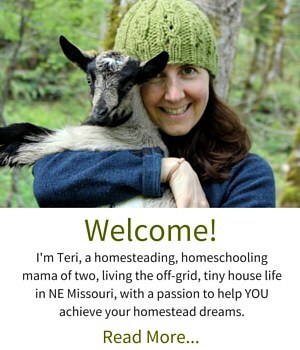 I think you and your husband are brilliant to build a small home and make every inch count. We have a small, old brick farmhouse, and it has served us well for the 21 years we’ve lived here. 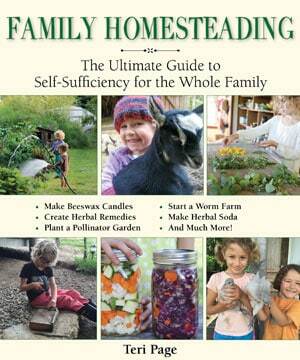 I’m enjoying reading about your homestead. LOVE your outdoor kitchen, too. Have a wonderful week! Thank you so much! 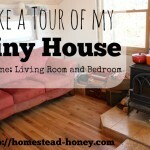 I love small homes in general, and it’s been fun to think of ways to create a space that works for our family. We just need a tiny bit more storage space, is all! They look beautiful! And what a great deal on the flooring, I love a good score! Thanks Ashley! I think the good deal on the floor is one of the things that most tickles me about it! Those floors look incredible! I especially love the pictures of the handle of Brian’s applicator! I am inspired and humbled by your incredible efforts to provide a home and low impact life for your family. It is truly amazing what you two have been able to build. More pictures please! Thank you Lisa! You are so sweet. I do love the way the floors turned out. ANd the walls too, really, Everything is shaping up quite nicely and it’s going to really be a beautiful home when it’s all put back together! I promise to put more photos in a post when we move back in! I love the floor, it’s beautiful! 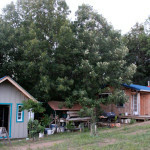 I love looking at pics of your house. I’m amazed how roomy and light it looks on the inside. Thanks for sharing! Thank you! Yes, the passive solar design really lets in a lot of beautiful light, especially at this time of year. It’s a very spacious feeling 350 square feet! Thanks Olivia! I’ll let you know if we need anything 🙂 It has been gloriously sunny and beautiful all month long, but Saturday night is supposed to get into the low 20’s, so we’ll be happy to move our bed back to its loft, and light our woodstove! Happy fall! Yes, Kris, they are tongue and groove boards. They go in quickly, especially in a small space. The most work was the sanding.